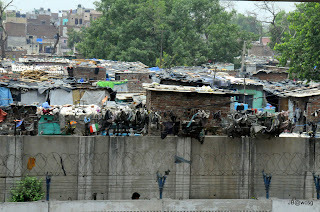 Yesterday, Friday, our team went to a slum in the northern part of New Delhi. We drove for over an hour in the clamor of horns and the chaos of buses, trucks, delivery vans, auto-rickshaws, bicycles and motorbikes. We turned off the major road onto very rutted and bumpy side roads. There were the Hindu shrines, and roadside vendors selling everything possible alongside the road. 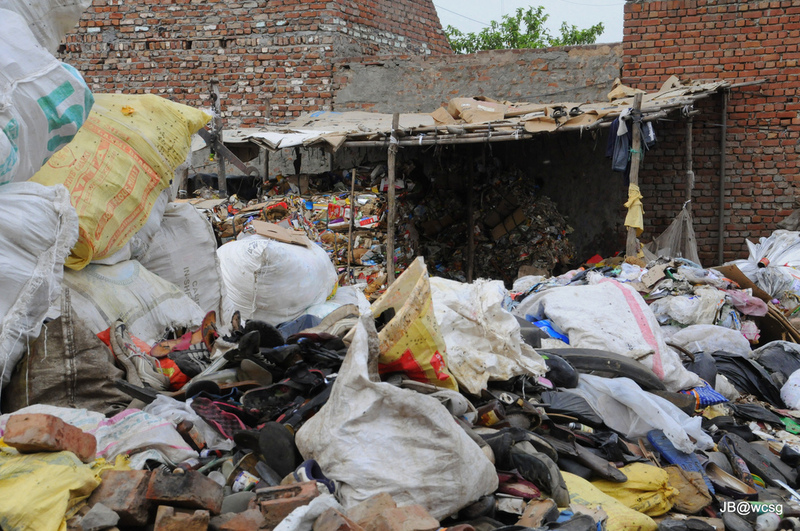 The ever-present trash piles seemed bigger and more numerous. I did see people picking through the garbage looking for items of use, to eat, or to sell. There were pigs, chickens, and cows wandering everywhere. The only animal more common than cows, are the stray dogs; they are lean and constantly looking for something to eat. When our 'rich person’s bus' made its way through the narrow streets, people would look up and you could see them wondering why were we there. I feared that this predominantly Muslim community would think our visit was to stare at their living condition the way people stare at animals in a zoo. 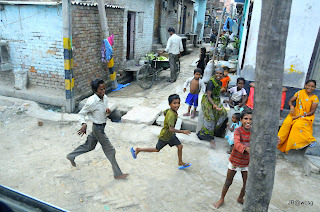 Honestly, we had spent the past week observing many aspects of rural and city Indian life. Hopefully, we were observing with curiosity the way life in India varies from life in Western Michigan, without passing judgment. 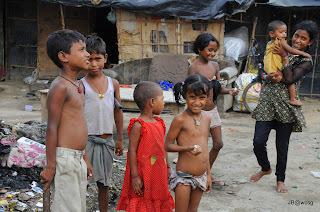 As we entered the slum community, it appeared that the role of curiosity was reversed. It became our turn to be the spectacle as the bus came to a stop. People from all over the neighborhood gathered outside of the bus. Uma encouraged us to hurry getting off of the bus because the longer it took for us to gather our supplies, the larger the crowd of onlookers would be. Thankfully, we had been joined by the two women and two men who run this Christian ministry, and school. I need to say that as we got off the bus into that crowd, I was scared. I put on a fake smile. We couldn’t walk directly down the alley to the school, because there was a death in the community. A 12 year old boy had died that morning and was laying in the alley outside of his house and surrounded by mourners. His body was to be burned before sundown that day. He had fallen 2 years ago and had been paralyzed since then. I wondered about his mother and if he had been a part of the school we were getting ready to visit. We entered the school building through a narrow doorway that led to narrow, and tall steps. As I neared the top I stepped over many pairs of shoes shed as the children entered their classroom. I turned from the stairs and entered a room to see 50 brown, smiling faces. They were all seated on the floor on mats. There were 25 young children and 25 older boys seated separately in rows. They were clearly curious about us, but also very happy we were there. The fear I’d been wearing fell off like a thick winter coat. We all waved and smiled at one another. There was much love that could only have come from God passing between all of us in the room. Interesting how it can be, there were such differences between us and very little ability to communicate, yet the love and peace of God was in and through us. We’d only been told that there would be teenage boys at the school about 30 minutes before we arrived. Because we were expecting only little kids in the slums, we had left all older kid activities in Manali. It was my responsibility to plan activities for the older kids, so this left me with nothing for them to do. We had brought two suitcases with activities, donations and candy. The activities we had planned to do (pasting foam pieces on a book mark and coloring a Bible story picture) would be an insult for these teens. (There were only a few girls in this age group, the only one I remember was the teacher’s daughter). I went downstairs to the place were the suitcases had been put and I prayed that God would help me to find something in there to do with these boys. I opened it and saw paper that had been cut to fold and assemble to make paper Frisbies. Thank you, God! I didn’t know how to make them, but I located two team members who had done them in Manali. They agreed to lead the session. I saw once again the power that music has to join believers in worship to the God we share. Chris, from our team, led several accapella worship songs and Annette played the violin. The kids were attentive; I think it was their first time see/hearing a violin. The boys surrounded us, and were eager to fold/assemble the Frisby. They were patient with my lack of skill, and it was clear that they were very bright and learned as quickly as we were able to teach them the folds. The thought came to me that many doctors and engineers come from India. I could see this aptitude in the boys as we worked. Several of our team members offered to paint the boys faces. I wondered how this would be received. They weren’t interested in that, but did like to have designs painted on their forearms. They said, “tattoo”. Anna’s comment was that they related some of the designs with Hindu dieties. As I mentioned before, we had a lot of young beautiful women on our team. Before the afternoon ended the guys surrounded them to flirt and ask questions. It was appropriate, but a little more of the uncomfortable type of attention men give to western women in this culture. All too soon, it was time to pass out the candy and to leave. We didn’t have enough candy bags for all of the kids, so we dumped them into a bag to distribute: 10 pieces per child. Once again, I saw their street smarts. The two men who had been interpreting for us and photographing the activities with our cameras, told me to count the 10 pieces of candy into their hands so that they could give them to the boys. I did, but when the boys approached me, I asked if they’d already gotten some and they said no. The man helping me let me know that they were scamming me and that he should be the one to pass out the candy. The teacher was a petite little lady with beautiful green eyes and was wearing a white Sari. She made a point to introduce herself, although we didn’t share a language. She also wanted me to meet her son and daughter who are both in the program. When was time to leave, we hugged and she told me, it wasn’t goodbye, because we would see one another in heaven. The walk to the bus was again lined with curious neighborhood people, but also with the children and adults that we had just sent several hours getting to know. The crowd surrounded our bus, waved, and smiled. One woman held up her baby so that I could see him. I saw one of the younger girls, probably about age 6, that had gone to the roof for the little kids lesson and crafts. She had her candy and the items she had made held in the folds of her Kurta so that she could hold them and wave at the same time. As we drove off, I felt deeply thankful for the opportunity to meet these people and to serve God in this way. I did learn later, that there is no water available at this school. They don’t have any money for a well and are unsure if the government will give them permission to get one. In the U.S. if there isn't water available for school, we close and send the kids home. While we were in the school, the camera and money belonging to one of our team member was stolen from the bus seat. 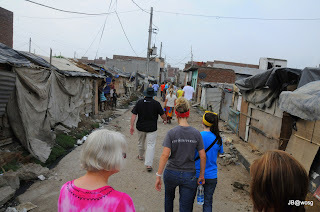 Today we were guided to a slum in the southern part of the city. This made the buildings and lack of water at the previous school look like a palace. We walked from the bus down a street lined with vendors and corrugated metal pieces that had been assembled into ramshackle dwellings. There were tarps and sacks used to join the metal piece. Families lived under them. Each was joined to another so that there were rows of adjoining cells of families. Again we were joined by 3 of the people from the previous day who are also involved in this school and women’s ministry. 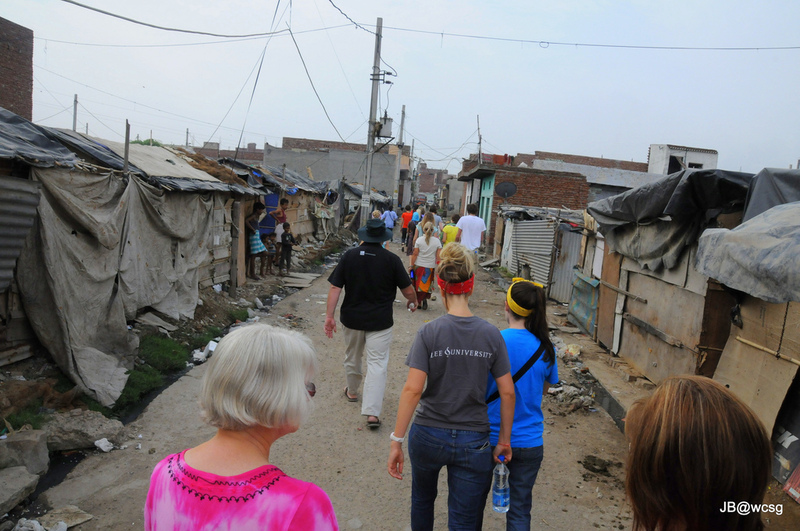 As we followed one of the women., she led several of us into a yard surrounded by scorched brick walls. We were told that there was a fire there 2 years ago. Because people burn cow manure patties for heat and to cook food within their dwelling, fires are always a concern. 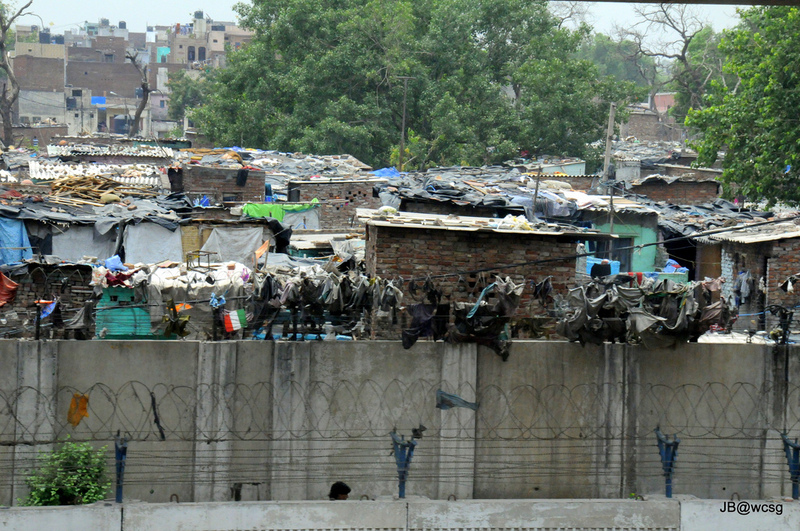 Most of the dwellings also have a blue or white tarps covering a portion of it. The proximity of the dwellings and the types of material inside, makes fire a real and deadly threat. I learned from one of the women that these people are in such temporary dwellings, because the government can relocate them at any time. She said that she was from Darjeeling Pradesh and her people had also been relocated. This helped her have something in common and it helped her establish trust with the people in this community. I have never seen filth like what we walked through to get to the school. Not only was there garbage everywhere, there was standing water that clearly had sewage in it. One of our bags fell in the water, we were told to leave it there. A well-meaning person from the school picked it up, rinsed it at the school’s pitcher pump and then handed it to me. I was unaware of the events that led to the wet bag in my hands, I was advised to put it down and use hand sanitizer. We entered the school’s courtyard through an wrought iron gate to find an open-air room. It had a red tarp over it to block the sun. There were also 4 small classrooms with tables and benches and a leanto against one of the rooms to provide another area of shade. The dirt and brick floor had been swept very clean. There was no furniture in this main meeting area. We saw 50 children were sitting on the floor on red blanket-like mats waiting for sand again, God's Spirit was clearly apparent. 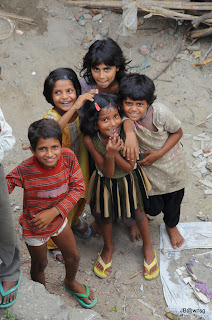 On Friday, we had joined these same children on a field trip to a doll museum in New Delhi. They were very unresponsive to us at the museum, but in their own setting, they seemed happy to see us again. There were neighborhood children on the roof next door watching us as well as children outside the iron gate watching us through the bars. In addition to the two ladies, Adelade and Tonge, the program director who had also been with us the day before were acting as our interpretors. WhenI showed the program director all of the school supplies we planned to leave with them, he explained that all supplies had to be taken to the main office for storage because people break into the school at night to take anything that is left there. Once again we sang to them, and Annette played her violin. Their little faces were amazed to see the violin and to listen to the songs. The story of Jesus' death was told to them. We divided into 3 groups for coloring and crafts. I have never, in my life, experienced flies like what are in that place. Mid-morning it was very hot and a teacher asked if it would be ok to serve some juice to the children. At that point the kids were busily coloring. Two young women mixed and served the juice, another teacher spent her energy waving away the flies so that they would stay out of the children’s cups until their their juice was gone. Before we left, our team surrounded the children to pray for them. It was a touching moment to see them in the center of the circle with their heads bowed during the prayer. First, in the US, kids have much more than the children we met and yet, I don’t think they are any happier than these children. Second, although these people have very little to offer, they made sure we were given a beverage in each of the schools, and we had full meals in Manali. I think the people of India are people of great graciousness and hospitality. Third, in each place we visited, they were very appreciative of our gifts, and that we would just come to share music, crafts and ourselves with the children. Fourth, In each of these settings, I was reminded that we are all under God. At the DUF Children’s home, the teacher said to me, “I will not forget you, please pray for us.” In the northern slum the teacher reminded me that we would meet together in heaven one day. As we left the southern slum, the woman who helps run the women’s purse sales told me how grateful the women were that we purchased their hand-bags. I told her that we took lots of pictures to help us remember to pray for them. It made me realize that is a use for our pictures in addition to recording our memories. Fifth, and of the utmost importance, these ministries are doing like Jesus did: He made friends, He helped people meet their needs, and He then shared the hope of heaven and salvation with them. Not only are these ministries in India making friends with outcast people, they are helping them to meet either needs. In the northern slum, women were coming to bank money they had earned in a women’s ministry to help them manage the money they earn. In the southern slum, the women have been embellishing handbags to sell. They had a display out for us to purchase. Some of the money will be given to the women and some will be used to purchase more supplies to make more. This women’s cooperative both with the banking and cottage trade gives some of these women money to help support their families. The teacher said that substance abuse within the male population is very high. This training is a huge help for these women and children. When a person feels respected and knows someone cares enough to help them meet some of their needs, that is when their heart will open to salvation that Christ offers. Jesus was a great example, He cared, healed, and fed before He shared His life’s mission. Join 'Follow by Email' if you would like to be notified when I make a new posting on the blog. Sunday p.m. Worship and a Performance. D.U.F Children's Home. In a word, awe-inspiring! 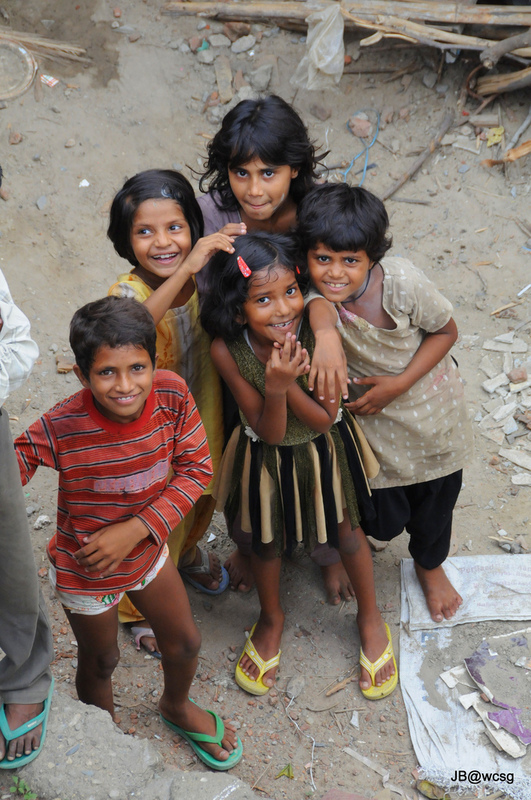 It is my hope that you will follow my preparations and journey to India with Orphan Outreach. I have been asking God for a way to serve Him after I leave my public school career. In May, I was accepted to join this team to share God's love with children in a Himalayan orphanage and with children who attend two schools in New Delhi slums. Please join me as I learn to serve God and the children of India.